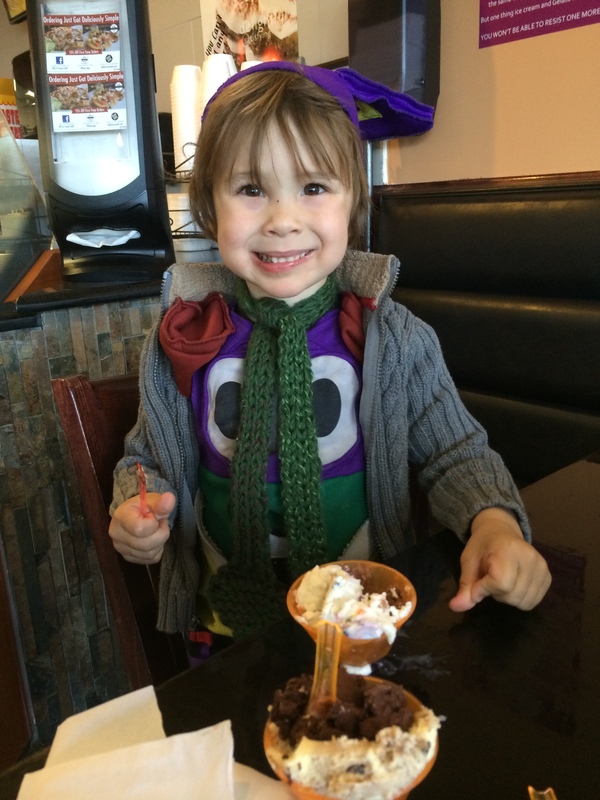 One on one time at the local gelateria = fun AND yum! 1. OLDER SIBLING ONE ON ONE TIME – The first few days home from the hospital were horrid when it came to C – my usually laidback and fairly compliant child had been replaced with a very loud, defiant child who cried more often (and much louder!) than my newborn did. 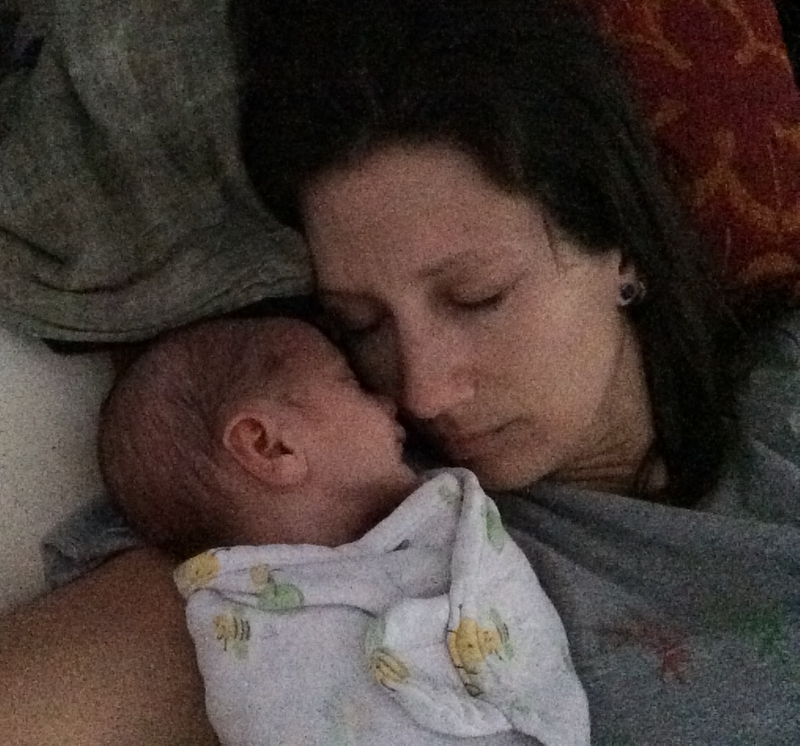 Add to that a concoction of postpartum hormones and emotions, and it seemed like one or both of us was in a constant state of meltdown (and ironically it was usually as the baby was peacefully asleep right beside me!) Our solution was to make sure that hubby and I each had one on one time with C (WITHOUT Baby Z) every day. It didn’t have to be a special treat or outing (though we have done a few of those), but C seemed to respond just as well when we kept things simple and as close to our pre-baby day to day routine as possible (going to the store with Mommy, wrestling with Daddy after dinner.) He definitely still has his moments, but each passing day is becoming better and better as we all come together to figure out a new “normal” for our family. 2. 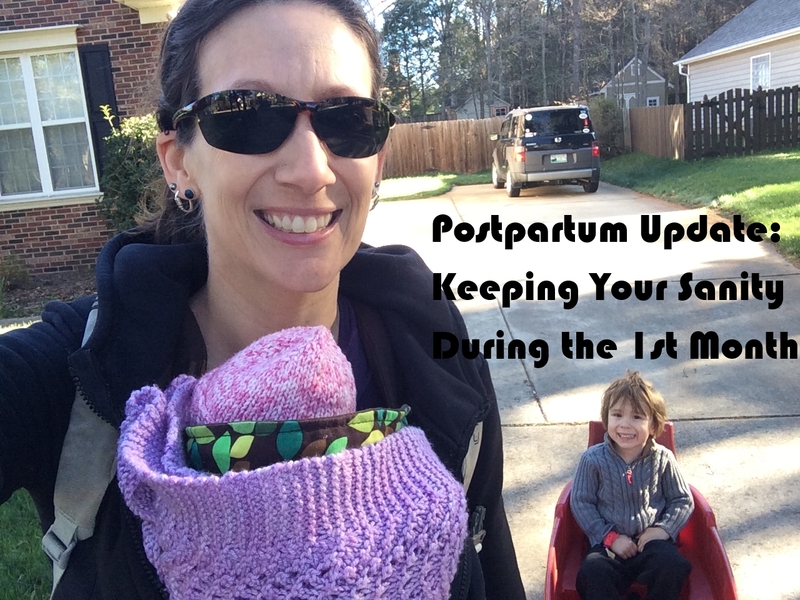 FRESH AIR – Pre-baby rarely a day went by that we didn’t leave the confines of the house for at least a little while. So establishing a “get outside” routine has been vital to everyone’s mental health. Some days we plan a mini-adventure for everyone to do together – for example on Baby Z’s 1 week old birthday, the whole family hit the trail. Steve and C mountain biked, and I hiked with Z in a carrier (at a conservative pace). After our 2.5 mile experiment, everyone was still happy, so we spent the rest of the afternoon leisurely on the playground. But most of our mid-week days have been more low key – heading to a park, walking down to our neighborhood creek, playing in the mud kitchen, or even just hanging out in the backyard digging with some bulldozers. Baby in carrier, toddler in wagon = fresh air on a trip to the store! 3. 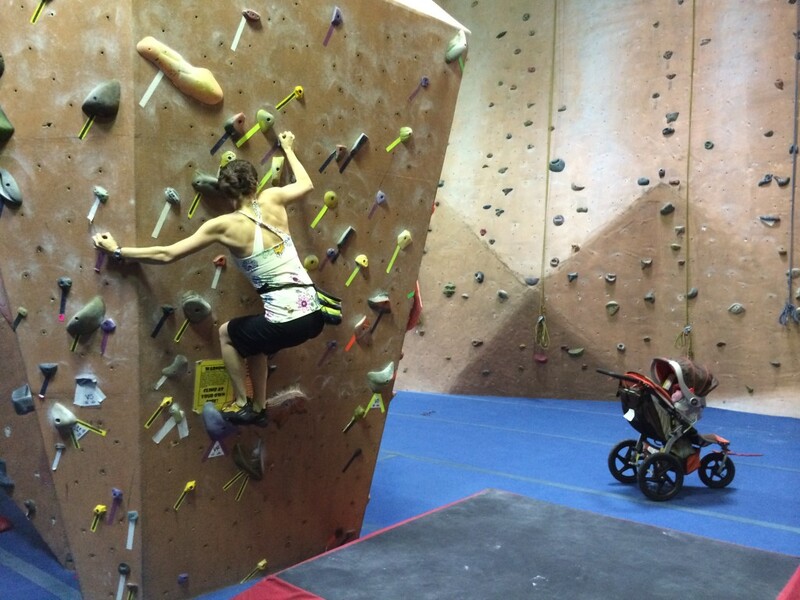 STAYING ACTIVE – To be clear, I am in no way advocating that women start a vigorous workout program immediately after giving birth. But for women who stayed active up through the end of their pregnancy and had an uncomplicated labor and delivery, in my (non-medical) opinion, it’s not necessary to wait until the 6 week mark (but please ask your doctor before following my advice!!!) In my experience, quickly getting back to (conservative) exercise can really help a mama feel good, physically, mentally, and spiritually. It’s amazing how something as simple as walking a few miles with Z in a carrier helped me to reset my mindset for the rest of the day. Another key for me was getting back to the climbing gym as soon as I felt ready, which this time around was just before the 2 week mark. Initially my goal was not to get a “workout” in, but just to let out some stress moving over the walls. 4. 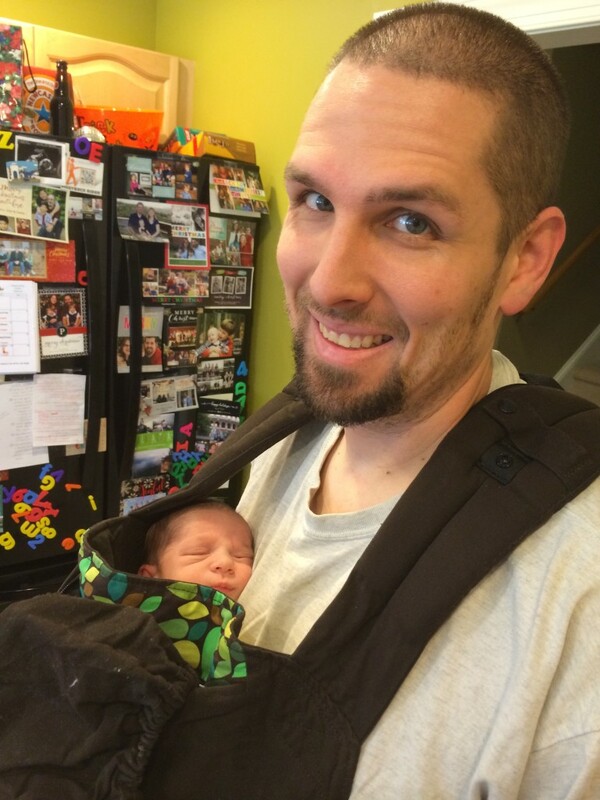 BABYWEARING – While a high-quality carrier is helpful with a first child, it is ESSENTIAL with a second child, unless you want to spend your postpartum life chained to the house. Our family swears by the Boba 4G – I reviewed it for my then 3 year old last fall (find it here), but a newborn review will be forthcoming in the next few weeks. The benefits of babywearing are largely documented (see here and here), but without getting off on too much of a tangent, I’ll just say it’s awesome for both mom and baby! In addition to the many physical and emotional benefits, it’s just plain convenient. Carrying baby hands-free means I give my toddler my full attention, whether it’s playing with blocks in his room or going down slides at the park. Floors can be swept, tables can be wiped down, and laundry can get washed and folded…the only thing I haven’t figured out how to do while wearing baby is taking a shower! We’ve certainly had our moments of tears, frustration, exhaustion, and feeling overwhelmed, but we’re figuring it out one day at a time. Family life with 4 is a lot more hectic than family life with just 3…but I can already tell you that Baby Z can hold her own and is a perfect fit in our crazy, fun-loving family. If this first month is indicative of anything, it tells me that there’s a lot more adventure on the horizon for us all, and I can’t wait! What great timing for these tips. My #2 was born one week ago, and my older daughter (normally very easygoing, non-tantrumy and sweet) has been going nuts. Need to start the 1-on-1 time ASAP!